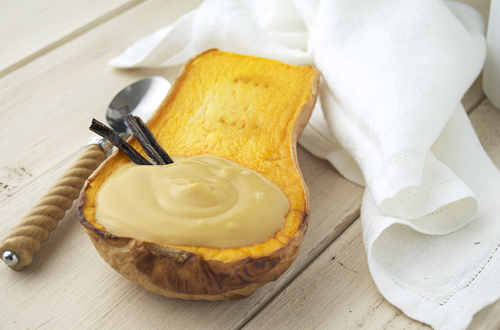 I saw this idea for butternut squash pudding a while back on one of my favorite blogs, Pinch My Salt, and was instantly hooked! Just like zucchinis in the summer, butternut squash rapidly fill my kitchen in the winter thanks to my mom’s distaste for them. 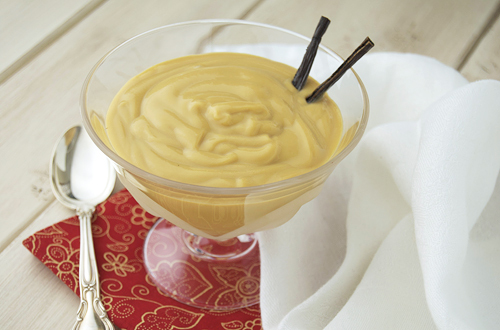 This pudding is creamy with that addictive buttery flavor of butternut squash. Just imagine how happy your Valentine would be to have a big bowl of this served to them. Or if you are like me think of how great it would be to curl up on the couch with a big bowl of this in place of a Valentine! In a small bowl, combine the brown sugar and corn starch. In your blender, blend the squash puree, milk, heavy cream, brown sugar mixture, salt, and egg yolks. Blend until very smooth then strain through a fine sieve (or cheesecloth) into a saucepan. Cook the squash mixture over medium heat, whisking constantly, until thickened and bubbly (about 10 minutes). Reduce the heat to low and continue cooking and stirring for another minute or two (your pudding should be thickened but still pourable). Strain the pudding through the sieve into a bowl (using a spatula or wooden spoon helps). Stir vanilla extract and butter into the hot pudding until completely combined. Let the pudding cool, then place plastic wrap on the surface, cover and refrigerate until cold. To make the squash puree, half the squash and roast face-down at 400F until soft (about 30-40 minutes). Must be squash season this time of year! This stuffed squash was an AWESOME dinner. Love the picture where it is served out of the squash itself. I’ve never thought of butternut squash in any way related to pudding but now it makes so much sense. Seems completely perfect for Valentine’s day…lush, unexpected and pretty. Oh I must try this! Intriguing! I hope I can find some frozen squash in my freezer. I love the idea of taking a savory type veggie and making a sweet dish. I have a butternut squash on the counter just waiting to become this pudding! Girl – this looks delicious! Love the pictures and the recipe! oh boy, does this look good – and healthy! I might try subbing sweet potato puree because I don’t have butternut squash. Thanks for the recipe! This is so clever! It’s making me very, very hungry for dessert!